The front of your home says a lot about you, I think. Which is why it's pretty silly that I waited 15 months after we bought our home to get ours in order. Ha! My excuse is that I was too busy working on the inside of the house. Yeahhh, that's it. It's not that we had an u-g-l-y front porch, it's just that it was a hodge-podge assortment that lacked any sort of semblance of a wow-factor. This is how it looked last summer -- just a basic assortment of plants (may you rest in peace, ivy and angel wing begonia). Recently, when Ian was out of town and I'd just about OD'ed on the Housewives and Giuliana & Bill, I got to work on filling some new planters I'd just gotten. I first saw these in our Crate & Barrel store in the spring, but decided to wait on them. In early July, I saw online that they'd majorly gone on sale and were available in store only. I figured our busy Charlotte store had none left. When I checked back in the store in late July, however, there were four, and all half off the original price! The salesgirl said that those four planters had just been returned that morning. I quickly snatched two up. To Home Depot I went, and my very favorite clerk there (who really should be working at a high-end plant nursery ... he is incredibly knowledgeable and passionate about plants!) greeted me with a hug and we went to work mapping out the planters. Yes, he and I hug every time. And he always asks me if I've fertilized my azaleas yet. To which I always sheepishly reply "Um, not yet. But I'm going to!". And for the record, I have now fertilized those azaleas. I brought home all sorts of goodies and got to work putting them together. First in went some gravel on the very bottom of the planter to weigh it down, and then some potting soil in the top portion. 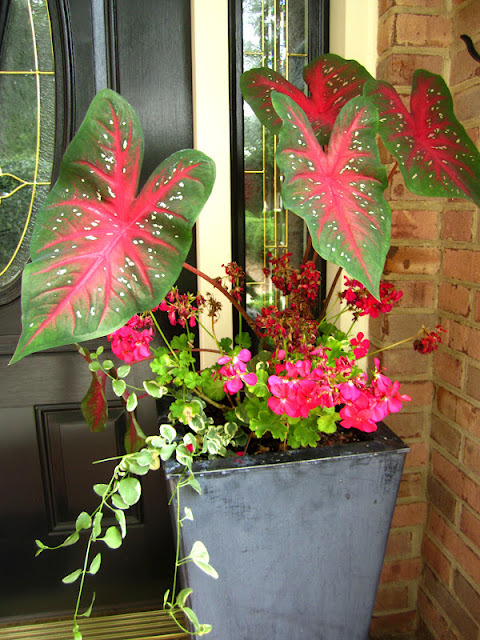 In went the elephant ears, the hot pink geraniums, and vinca vine. We chose this combination because of the varying heights: high, medium, and low. Or, a thriller/filler/spiller, if you will. And now, nearly three weeks later, they are still looking great! Okay, maybe I have to deadhead some of the geraniums, but still. The plants have all filled out a bit and I've added some accessorizing to the door windows. See what you can do in only fifteen months?! 1. Freaking cute dress 2. I love the dramatic flower pots, they are perfect for your front porch next to your double doors! Great job (as always). Will you decorate my house when I finally get one?! definitely worth the wait! love the pops of colors! I agree with Jordan, decorate my porch too!!! Love it. I learned something new with the thriller/filler/spiller! Your dress is just adorable by the way. I love the tall planters. I agree, the outside of a home definitely says a lot. My must have is an American flag hanging out front. Great job!! You look super cute in your dress! Love the pots, it looks great! I think the planters look wonderful and the thriller/filler/spiller guideline is great. I think you have geraniums as filler, though, not begonias. Seriously ... that looks amazing! I love what you did with everything! 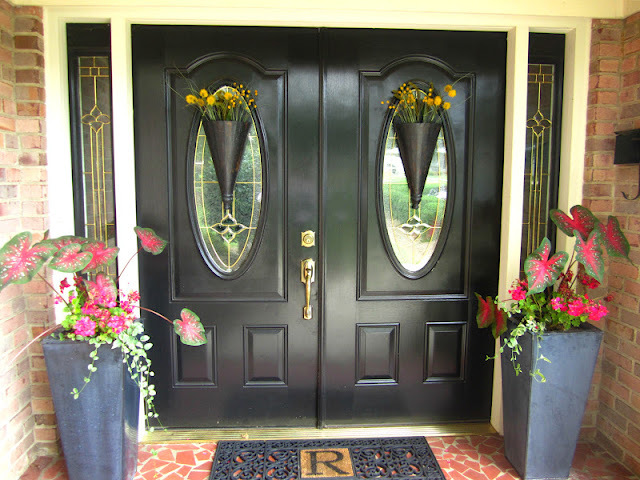 Having front doors like that is something that I've wanted for a very long time, I'm so jealous! Haha I love that you hug the guy at Home Depot. Heck, why not?! We have the same planters - love them! Love the height and the drama that it adds! Your dress is super cute too! Oh I LOVE me a good front porch. Your blog is fabulous. Newest reader! Looks great! It's always fun to update the front porch area! We're in the process of choosing some plants to put in our planters. 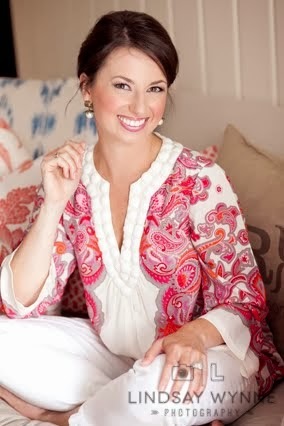 Love your dress, love your front porch! Cute blog! !